In Europe, Freelance-Market.de our German parent site, has won another award. 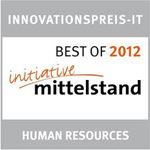 The renowned "Initiative Mittelstand" awarded Freelance-Market with the "Best of 2012"-award for innovative IT-solutions. The product "Freelance-Market" convinced the jury, under the auspices of the federal government in particular. Freelance-Market offers its fast contractor search, the clear listing of candidates and the fast, free presentation of the optimal freelancers and a particularly efficient access to the most suitable contractor. In this way, businesses save time in identifying the appropriate service and reduce hiring mistakes. "Initiative Mittelstand", which can be translated into "initiative for small and medium enterprises" consists of a panel of experts from IT-industry, academia and the media. The panel evaluated the submitted products and solutions based on a set of criteria. Some success factors are the level of innovation, customer value and suitability for SMEs. Overall, more than 2,500 companies applied for a for a prize in one of the 40 categories. Freelance-Market received the "Best of 2012" in the category "Human Resources".